The other day, I had an epiphany. In one window, I’d been watching a series of tweets on how State CIO’s put collaborative tools at the bottom of their 2010 technology priority list, even though their top 3 strategic goals included better management of labor costs, workforce optimization, sharing of work .. in a nutshell: productivity. In another window, I’d watched die hard SMCHAT members bemoan the boss who wouldn’t let them communicate via blogs, for fear they were wasting time. Forget the great ideas and potential innovations that were emerging. That’s when I snapped, so to speak. From here out, I’m calling it facebook syndrome. You may know someone who has it too. It assumes social media is just about planning parties and swapping pictures, and it definitely doesn’t help with management buy-in. In fact, there are two working definitions of social. One connotes entertainment, and another, the one we’re talking about for Government 2.0 (#GOV20) and E2.0 and any serious commercial application is about building new work groups; facilitating new engagement for problem-solving; driving better partnerships; enabling culture change; and, quite literally, unlocking innovation. Let’s change the game. Let’s rally around a new name .. like “new media” perhaps? .. for commercial applications. And to sell it, let’s demonstrate a basis for measuring actual productivity gains, showcasing the people working closely together on shared problems that only recently had never met. Watch people get excited about coming to work again. It’s not social media that we’re chasing. It’s the networked learning organization. To get beyond images of wedding crashers, the solution language needs to reflect the mission. Enterprise 2.0: Can we get there from here? Most would say Enterprise 2.0 is a future state: a time when people inside corporations are connected and engaged, a world where social media has taken hold. That’s how I like to frame it. Arguably, with cynics in the majority, progress will be gated by historical inertia in business, with deep organizational silos and a crowded graveyard of failed management “silver bullets”. Without a doubt, to overcome an industrial management culture that is over 100 years old, we face a difficult journey. On TUES at 8 pm ET, starting 9/29, we will premiere the #e20ws workshop. This session will be highly interactive: (a.) we’re going to work to attack the challenges in corporate social media adoption, and (b.) we’re going to produce useful ideas that you can bring back to your office. We’ll run this alternate weeks, so plan for 2nd and 4th Tuesdays (follow-on sessions: 10/13, 10/27, etc.). Here’s our agenda, to get the conversation started. T2. e20 Challenges of Silo Culture. T3. e20 Standards, Alignment and Diversity of Thinking. T5. e20 SM Technology (intro). For more background reading, check out core principles of social media, provided by #smchat. There won’t be time in one session to complete the above agenda; we simply want to lay the ground work for future discussions. I’ve hosted other “#chat” groups, (#smchat, #ecosys) and I think you’ll find the conversations are fast-paced, insightful, and a good source for networking with thought leaders. I hope you’ll use the opportunity to engage, learn, and network. In fact, just by being there you’ll be participating in the social media experience. Look around your company. Are teams working at cross purposes? Are you seeing good ideas get sidetracked? Do organizational silos and the politics that go with them result in project delays and failures? It’s time to engage with others tackle these challenges and identify new ways to enhance productivity in your organization. You’re invited to participate in a bi-weekly Twitter-based conversation (#e20ws), beginning Tuesday, September 29 at 8 pm ET. We’ll discuss culture, engagement, alignment and technology. And that’s just for starters. If you need some background on Twitter chats and hashtags, you’ll find that in more detail here. All corporate professionals are welcome, but teams that generate insights, make connections, and share ideas across the organization will get the most value. These days, that’s almost everybody. But to create some focus: think Marketing, HR, Communications/PR, Customer Service and IT. if your company has a social media policy, become familiar with it before engaging in online, public conversations. That’s it! Now, all you have to do is show up and bring your point of view. Plan to network and learn in real time with some of the most engaging, insightful folks in industry. 20th century silos and workgroup problems have been daunting for everyone. The 21st century is already in progress. We’re saving you a seat. Companies seeking to innovate want to spark collaboration, but the path is often elusive. Twitter is positioned to help change this. It’s founders have recently started talking about opening up microblogging in the commercial space, per a recent interview w/ Biz Stone. But first, there’s a hurdle. Companies must start to trust employees to communicate openly on shared topics inside the firewall. In theory, that shouldn’t be so hard. It simply means employees must exercise judgment, as has always been required, deciding when email, phone or (heaven forbid) face to face meetings would be more appropriate means to share something. But because the new mode of communication is out in the open, the bar is raised. Judgment will be even more important. Point made. 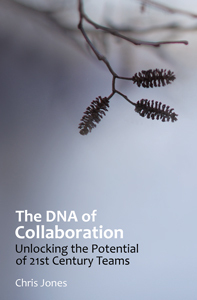 I believe employees will see the value of 1:n collaboration and will step up to the plate. When execs and IT realize the water is safe? That’s when Twitter (or micro-blogging tools like it) will start unlocking doors. What is 1:n (or “one to many”) communication? We’ve all been buried by emails and convoluted distribution lists that would have been far better served as an “open wire” dialog or chat. It’s the input that creates your opportunistic “oh, I didn’t know that was happening” response. Today only Twitter can efficiently spark that electronically in real-time. I believe Twitter and solutions like it will have an evolutionary impact on communications when they begin to take hold. Given the chance, most want to help drive an innovative idea or solution. They seek to get their ideas in circulation. 1:n communication is the better mousetrap. Not to sound impatient, but why wait? Security in the corporate setting was solved long ago. Granted, when information is going outside and across the firewall, who uses Twitter and definitions of “safe ground” for tweet content is a bit more complicated. There have been some great posts on the ‘spectrum’ of corporate views on how to interact with the public using Twitter including Marketing, PR & Customer Service guidance. This aspect is evolving. But let’s not sacrifice the internal work group benefit to wait for the external Marketing & PR side to catch-up. It’s time to get down to the business of effective 1:n corporate communication. Twitter represents a powerful new medium for more effective enterprise collaboration. Become an advocate for change in your organization. Help take the “social” out of Social Media by putting it to work on important business conversations. That leg-up will give Twitter the chance to work it’s collaboration magic in the enterprise. Start brainstorming with your colleagues, how could you leverage “1:n” communication to solve business problems? In times of dramatic change and crisis, executives (perhaps in line with human nature) revert to known formulas .. tapping structured, controlled and seemingly “safe “solutions. In Stephen Billing’s blog “Organizational Change is Not a Relay Race” he warns against relying on formal & rigid decision processes in times of crisis. Most dangerous: hand-offs between executives, consultants and HR .. passing the baton of responsibility from runner to runner. We’ve all seen this happen. If you’re leading an organization in crisis, it is no time for hand-offs. It introduces delay, dilutes both message content and ‘signal strength’ .. and in the end, serves to diminish trust. But to really get at the core of the disconnect, we need to understand how change works. I frame the issue as two contrasting views: the organization as machine vs. the organization as living organism. In the latter view, change brings in an organic element. Transformations take place in every cell. Granted, there are communication and control processes present in the organism too; each cell plays a vital role, as in a machine. But in a living organism, just as within an organization, success (survival and adaptation) depend on symbiotic adjustments from every minute part of the system. No doubt the industrial age has influenced the thinking of executive management. But we must now choose our relational paradigms more carefully, especially at times of crisis when time is short and emotions are running high. Machines excel at repetition. Living organisms excel at change. Take a good look, there’s plenty of change and crisis to go around. What kind of organization do you need to be?